As the struggle of the Hebrews to escape slavery in Egypt came to its climax, God instructs them to do a ritual that will become their way always to remember that liberation. For an audience not yet accustomed to celebrating the Eucharist and appreciating all its meanings, Saint Paul gives a basic lesson. Prepare for the moment of liberation by a ritual meal (and make the meal an annual ritual). Ritually mark your homes to exempt yourselves from the coming slaughter, which will effect your liberation. Our Liturgical Setting: It's not hard to see the themes here that resonate with our seasonal themes. Our ritual meal is the Eucharist, instituted not when Jesus was at the height of his powers, but when he was most in danger. We use the metaphor of the slaughtered lamb to help us understand the death of Jesus. Because of Jesus' death and rising, we're liberated from sin and allowed to return to our true home. While reading this aloud, mark the differences by pausing, changing your pace, and changing your tone of voice. For example, for the first set of detailed instructions (1), use a staccato, matter-of-fact delivery. Then slow down (2), as if you expect your hearers to be puzzled by the orders to apply the blood to the doorposts and lintel. The next sentence (3) is, on its surface, odd for a different reason: we think of ritual meals (whether Sunday mass or a secular honorary banquet) as dignified, stately affairs that last longer than ordinary meals, with periods of inactivity. But these diners are to eat with one foot out the door. Make sure your listeners see that image in their minds. The next sentence (4, "I will go through Egypt, striking down ...") introduces an entirely new idea, so don't let it just blend into the prior sentence. The sentence after that (5) is also startling; be sure to express clearly how the marked doorways win the Hebrews exemption from the slaughter. The final summary sentence (6) is meant to tie later readers of the book, with their now institutionalized Passover ritual, to the original event. It deserves a solemn, triumphal rendering. The Historical Situation: Passion (Palm) Sunday's Lector's Notes spoke of how the great Christological hymn, Philippians 2:6-11, predated Paul's conversion. Today Paul quotes another source in the tradition that was handed to him upon his conversion. He even says he received this "from the Lord." 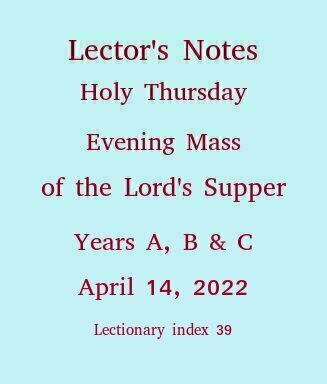 This suggests that celebrating the Lord's supper was an unbroken tradition from the very beginning of the church. But interestingly, the larger context of this passage, in the first letter to the Corinthians, chapter 11, especially verses 17-34, shows that some early Christians needed some serious instruction about how to celebrate the Eucharist properly. Proclaiming It: Paul implies that the purpose of celebrating the Eucharist is to proclaim the death of the Lord until he comes. He may mean simply that Christians remind themselves and one another of the death and resurrection of Jesus, by this ritual act. He may also mean that Christians prepare themselves, by this ritual meal, for missionary proclamation of Christ to the world at large. You as lector need not decide, but you should not let this sentence get lost. Rather make it sound like the climax that it is. 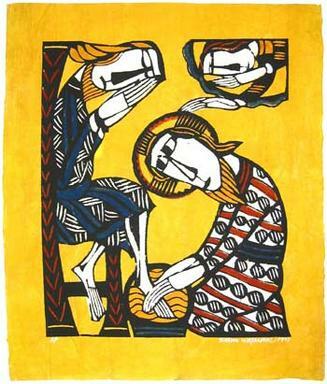 Christ Washing the Feet of St. Peter, 1963, Sadao Watanabe, Japanese, 1913-1996. This site says of the print, "Description:	A bold and most impressive rendering of John 13.6-II. Watanabe uses the device of elongated hands, fingers and toes and the large eyes of Jesus to stress the importance of this symbolic act; this device is reminiscent of early medieval book illuminations."